Building on more than 45 years of experience in deep foundations and ground stabilization, PRECO-MSE provides custom solutions to meet specific objectives for a broad range of projects and clients. Deep foundations are often the first stage in successful infrastructure projects this is something PRECO-MSE fully understands. Thanks to our team of more than 20 highly qualified professionals, cutting-edge technology and equipment, and a vast network of suppliers, we are able to meet the most stringent industry standards and deliver projects that are on on-time and on-budget. The use of piles is an excellent option for consolidating and stabilizing building foundations in soil that lacks the required load-bearing capacity to support future infrastructure. Piles transfer the load onto sufficiently stable ground located at greater depth. The deployment of piles is a key area of expertise at PRECO-MSE. For the past several years, we have been working closely with R&D departments at leading European construction companies to design hydraulic pile-driving equipment and drills specifically for projects in North America. This custom-made high-tech equipment provides us with a major competitive advantage, enabling us to implement all types of piles quickly and effectively. General applications : commercial and industrial buildings, bridges, viaducts, and other engineering structures. PRECO-MSE provides multiple solutions designed to improve soil structure and geotechnical conditions wherever the ground’s infrastructure-bearing capacity is insufficient or wherever damp-proofing or waterproofing is required. Potential target sites for such work include contaminated areas and locations with high groundwater concentration. In accordance with soil properties and project objectives, we use various methods to strengthen the ground by inserting columns, walls, panels, and other robust structures. 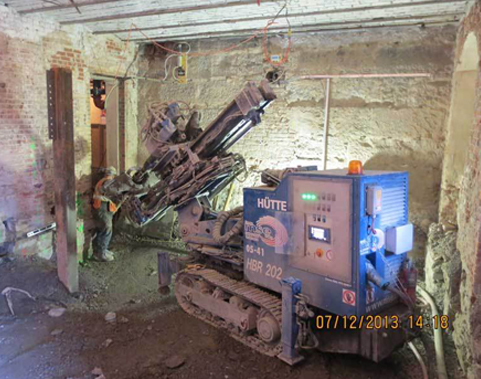 High-pressure injection of cement grout through boreholes, use of bentonite walls, and installation of sheet piling are among the tried-and-tested techniques that PRECO-MSE most frequently employs. General applications : dams, mining sites, commercial and industrial buildings, major infrastructure projects, and more. Retaining walls are everywhere. They support critically important infrastructure, including highways, bridges, and rail lines as well as countless commercial and industrial buildings and underground parking garages. 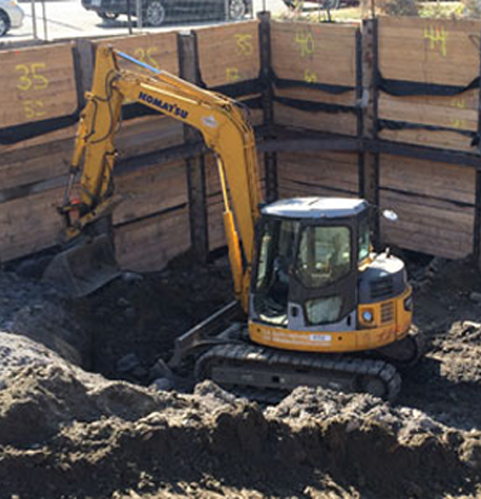 Given the growing scarcity of building sites, property developers are often compelled to stretch some buildings’ excavation zones right up to adjacent properties or dig down to great depths to build multi-level underground structures. That is when the construction of retaining walls, which holds back soil in a restrained area, becomes essential in preventing landslides and ensuring the safety of residents and construction staff. 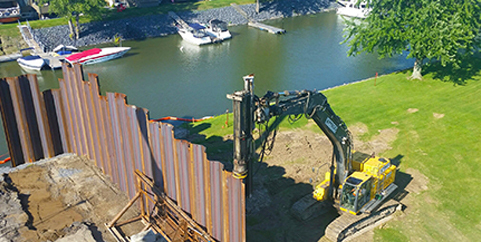 PRECO-MSE specializes in building multiple types of retaining walls, both on land and in water. Our teams have built these critical structures for major large-scale projects such as the Turcot Interchange and the new Champlain Bridge in Montreal. General applications : bridges, highways and other roadworks, railways, commercial and industrial buildings, multi-level underground structures, and more. As a recognized pioneer in drilling works in North America, PRECO-MSE provides its clients with all the benefits of its extensive field experience and leading-edge equipment. Our team of drilling experts has the know-how and technology to get the job done right. In fact, our expertise accounts for our leadership position in all types of anchoring projects. Anchors stabilize structures by shifting part of their load to the ground in which they are inserted. Recent amendments to Quebec construction standards have resulted in the more prevalent use of anchors, helping to endow commercial and industrial buildings with wind-bracing capacity. 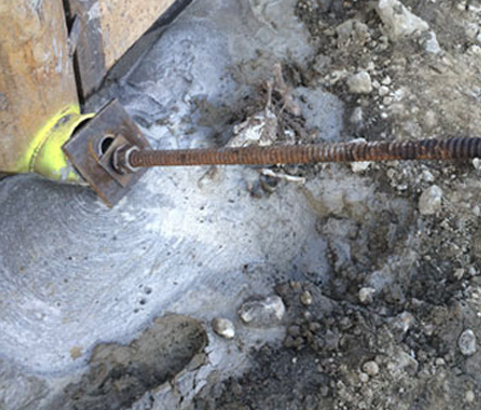 Anchors offer an ideal solution for protecting infrastructure from seismic events and strong winds. General applications : dams, commercial and industrial buildings, hydro lines, retaining walls, and more. Thanks to extensive expertise built over the past 45 years, PRECO-MSE can deliver deep foundation solutions both on land and at sea. 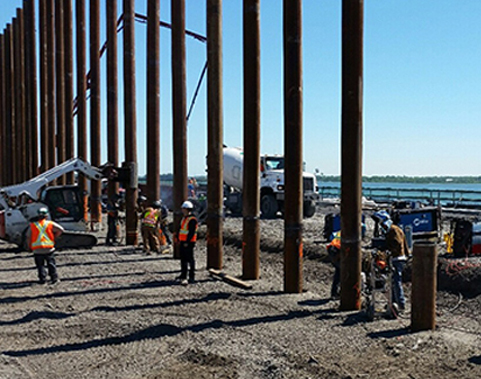 Our specialized teams can achieve a wide variety of marine structures as was the case for the new Champlain Bridge project in Montreal. PRECO-MSE has its own in-house engineering department, which allows us to control quality assurance on all our projects, from design to implementation to delivery. Our team carries out statistical and dynamic tests on all types of structures to validate their capacity. This expertise has made PRECO-MSE an industry leader as well as a trusted partner for other construction companies seeking to validate their structures’ quality and capacity.